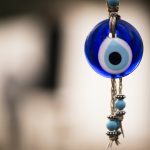 Nazar is the original name for what we know as Turkish eye or Greek eye. Endowed with strange powers that humans have not yet been able to unravel, it protects against all the evil that can reach us. Now, get to know everything you need about Nazar. Nazar Boncugu is the complete Turkish name for a powerful talisman. This talisman began to be used for thousands of years by practitioners of the Islamic religion, but gained adherents worldwide and different religions. They say it protects against evil’s eye and envy, as well as being considered a lucky symbol. If you walk through Turkey, you will see this amulet everywhere. Women have adapted the Nazar and use it on all kinds of jewelry (earrings, necklaces, bracelets, etc). People also often hang the amulet on their homes, offices, shops and cars. You can find Nazar in several sizes depending on its use. But as for its color, it is always the same: blue. The color is blue because they believe that evil eye has this color. Its shape is a circular or drop eye and the most common material is glass. All Turks believe that with this amulet you will be protected from the bad energies. It works as follows: every time a bad energy comes near you, the amulet attracts and destroys it. Therefore, they will never reach you. There are some myths and reasons for the origin of Nazar. We are going to tell you one of them. Centuries ago, there was a city by the sea with an imposing rock. This rock was in the water and not even with the force of a hundred men and explosives, it cracked. In this city, there was a man known to carry lots of evil’s eye (Nazar) where he went. They decided to call the man to look at the stone. When he reached the stone, he was amazed at the size and said out loud “Oh my God, what a huge rock!” Just as he said it, there was a roaring noise and the stone split into two pieces. Some cultures do not like to talk about the evil eye because some people believe that the more we talk about evil, the more we will attract it. In Turkish culture, it is different. Although widely feared, the evil eye is openly discussed by people, even in an attempt to protect themselves. Babies, for example, as soon as they are born are already targeted by the use of Nazar. And this came from an ancient story. Because of this story, all Turkish mothers put a Nazar in the babies’ clothes. A woman gave birth to a beautiful, healthy baby, with very pink cheeks. Soon after birth, all the neighbors went to visit the baby and praised him, as all people always do. It turns out that a few weeks later, the baby became ill and the doctors could not explain the disease. Then, he was diagnosed like that, pure evil’s eye. Regardless of your age or situation, we strongly recommend that you pay attention to this amulet. It is well known for scorning envy and evil’s eye. You can use the amulet to protect yourself, your loved ones and your home. If you find your Nazar cracked, this means that it worked in its protective function. If this happens, immediately replace it with a new one. When you are feeling particularly threatened, you can perform a specific nazar energizing ritual. You will need a herbal candle, a smoker, a blend of herbs for spiritual protection and your Nazar. Start by putting the herbs in the smoker and go through your house, clockwise. Start and end at your front door. After the process, light the candle and place it on the right side of the Turkish eye. Concentrate and pray for protection.